A highly personal reading from conductor Jeremy Backhouse, emphasising flexibility of phrasing and beauty of tone. 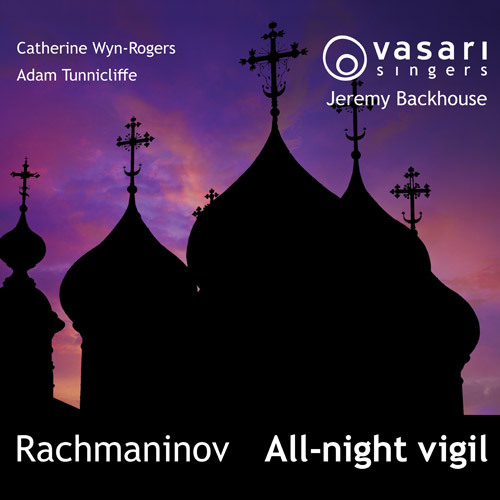 Rachmaninov’s All-night vigil (Vespers) is a work which is rightly popular both with choristers and with audiences. Like many choirs, the Vasari Singers has been performing the work for quite a number of years and in part to celebrate Jeremy Backhouse’s 60th birthday, he and the choir have recorded the work to be released as the second disc on the choir’s Vasari Media label. Though the work was premiered in the concert hall, Rachmaninov intended the All-night vigil as a liturgical work. Though richly orchestrated and more coherently symphonic than earlier settings of the Russian liturgy, Rachmaninov follows the limitations that liturgical performance entailed, with no use of instruments and a great deal of traditional chant. But the work is also a romantic attempt by Rachmaninov to get to grips with his Russian roots at a time of great turmoil (he would be forced to flee Russia for ever two years after the work’s premiere). In the last 30 years there has developed a tradition of performance of the work by Western choirs, a tradition which has developed a lighter more flexible view of the work than some of the more classic Slav recordings. It isn’t just whether the choir’s second basses can manage to be adequately audible in the low notes, but the attitude to phrasing, clarity and general lightness of texture. This feels very much like a performance, a concert work. Though the work is introduced by the chant for the Deacon and Priest (rather than with Rachmaninov’s choral ‘Amin’ response), and the booklet has a series of admirable descriptions of the service which can be followed as you listen, you would never mistake this for a liturgical performance. For me, the performance lacks an essential fervency. In this case, I would be happy to have a little more roughness of texture if it meant greater intensity too. Here Backhouse and his singers concentrate on sheer beauty and expressive flexibility. They are well partnered by soloists Adam Tunnicliffe and Catherine Wyn-Rogers, both singing in a style which complements the whole. This is a beautifully produced and thoughtful disc which will appeal to the choir’s many admirers as well as those looking for a highly finished account of the work.